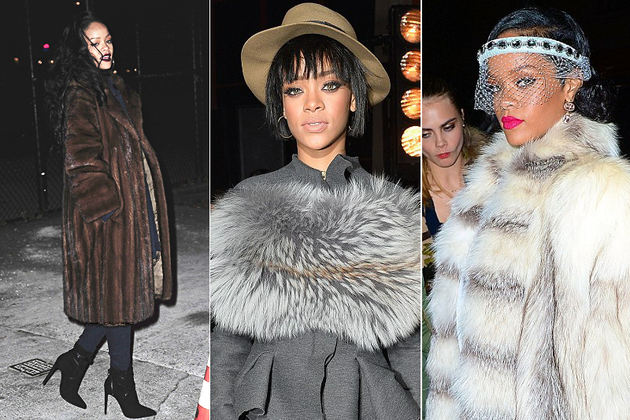 Celebrities Who Wear Real Fur. Even though fake fur is just as stylish as the real thing and cruelty-free, some celebrities continue to use real fur as a status symbol and fashion statement. Whether you want to boycott them or applaud their fashion sense, discover a few celebrities who wear real fur. While some celebs, like Paris Hilton, gave up fur once they realize that the practice of skinning animals for fashion is cruel, others continue to proudly show off their fur coats. Here are the celebrities who are committed to wearing real fur. Even though she seems to be interested in a vegan diet, Beyoncé doesn’t see any connection between that and her luxurious fur coats. From fur-lined jackets to huge coats made from real fur, the singer has been seen wearing fox, mink and chinchilla. 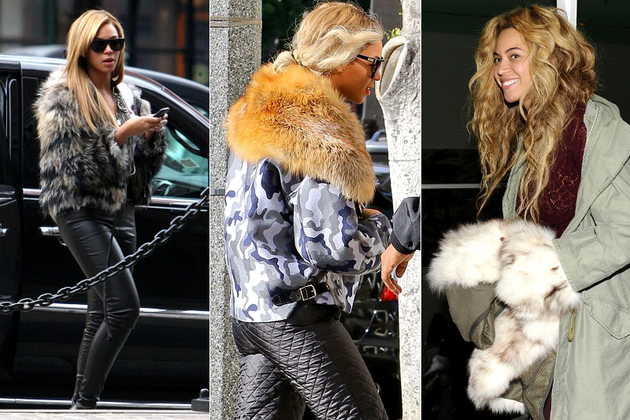 PETA has criticized her wardrobe choices, but Beyoncé remains one of the celebrities who wear real fur. Not only does Kim continue to wear fur, she also objects when people spread rumors about her giving up fur, because that makes her look... bad. “I haven't bought any new furs since Khloe’s PETA ad but I definitely will not look like a hypocrite when I wear fur and people put up these fake stories about me turning over a new leaf and giving up fur!” she wrote on her official blog. Celebrities who wear real fur often make PETA’s worst dressed list and Catherine Zeta-Jones is no exception. The organization accused her of “working her way through Noah’s ark with a knife”. Besides wearing fur coats, the actress also enraged animal activists with her choice of accessories, including an alligator skin handbag. 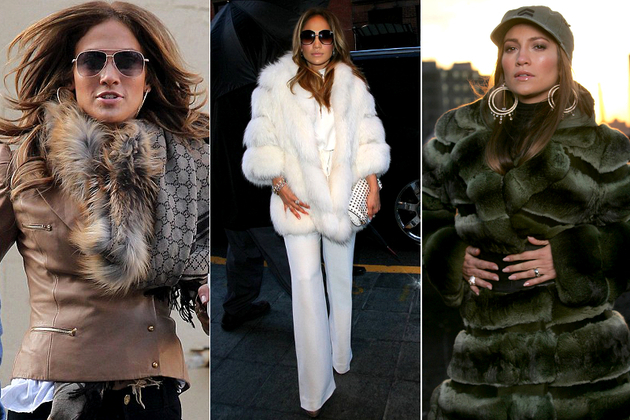 Nicknamed “Jenny from the butcher block” by PETA, Jennifer Lopez is one of the biggest lover of real fur in Hollywood. The singer, actress and television personality is an equal opportunity offender when it comes to fur. Over the years, Lopez has worn everything from foxes and rabbits to minks and chinchillas. Her love of fur was also reflected in her Sweetface clothing line. Nobody knows how many of Rihanna’s furs are fake and how many are real, but the singer was also spotted wearing snake skin accessories before getting criticized by PETA. Unlike other celebrities who wear real fur, Rihanna has never acknowledged the controversy in a public way, but her choice of fashion labels clearly indicates that cruelty-free style is not a big concern. 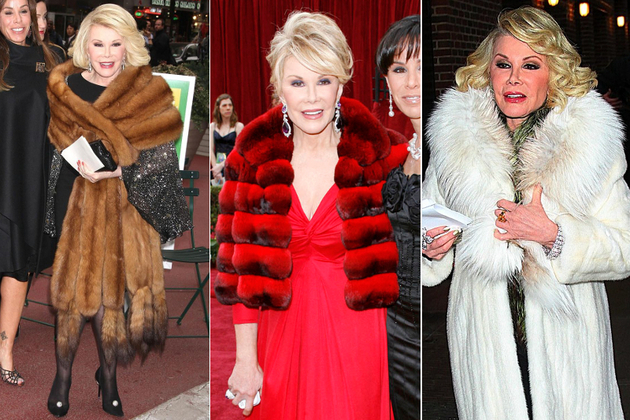 After getting her first plastic surgery in 1965, Joan Rivers has been criticized for being fake, but her furs are real. Calling fur coats a “necessity” in New York during winter, the 80-year old comedienne has even made jokes about her sable coat being made out of all the dogs she had during the years. Wearing a raw meat dress may have seemed like a futuristic fashion statement, but Lady Gaga turned out to be quite conservative when it comes to real fur. The singer has been criticized by PETA multiple times for being among the young celebrities who wear real fur, but has spoken out in defense of her style choices. “I have truly always stayed away from skinned fur, especially I have never been able to afford a nice one, but this does not mean my morals are rigid and that I won’t bend at the sight of an absolute art piece of a coat. I have no chains about this”, she wrote on her fan site Little Monsters. 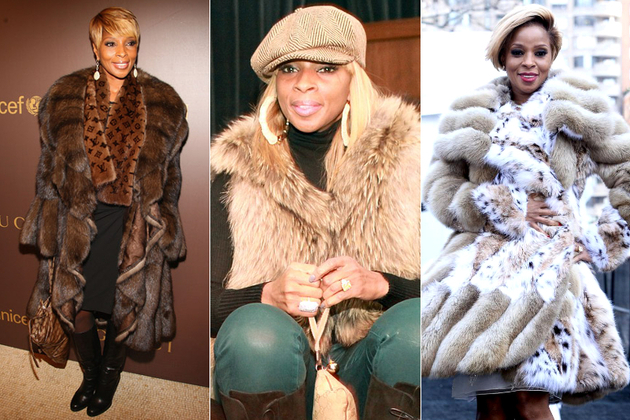 Seldom seen without a fur coat or accessory, Mary J. Blige really embraces her love of dead animal pelts, even those that cost $100.000. She even wore fur on her December 2013 appearance on “The View”. The Vogue editor-in-chief is one of the celebrities who wear real fur and refuse to feel any guilt about it. Even more, Wintour continues to use real fur in the pages of Vogue, despite protests from animal activists. “There is always a way to wear fur. Personally I have it on my back!” Wintour once declared. 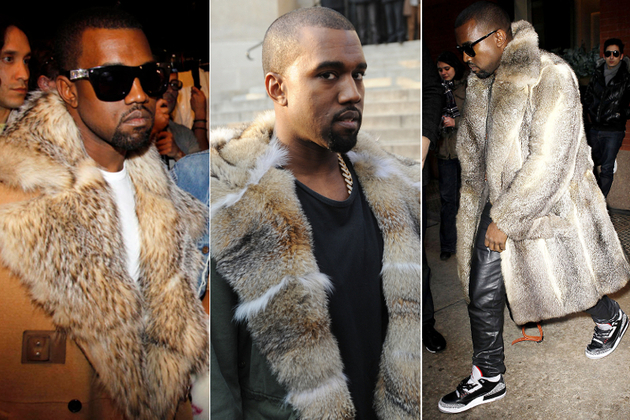 A big fur lover, Kanye West has even used it for his fashion collections. 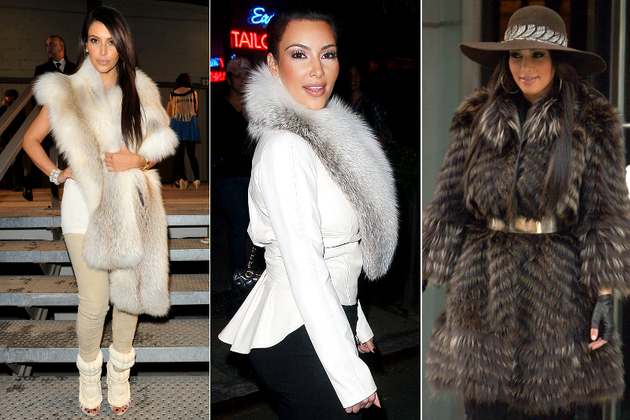 When he’s not wearing matching furs with Kim Kardashian, Kanye uses fox and lamb for his own creations.